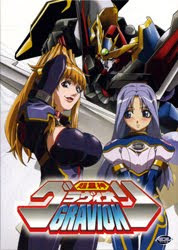 The Anime Archivist: Video Backlog: "Gravion"
Story Outline: In trying to search out his sister Eiji Shigure has infiltrated Saint-Germain Castle owned by the mysterious billionaire Klein Sandman. He is caught out and attempts to hide in a hanger, but eventually ends up as a pilot as part of a team for a robot named Gravion (created by Sandman) to fight against mechanised aliens called Zeravire. Mini Review: There is a lot more to this show than what I have written; maids, lost and lots of maids women with huge breasts, some limp mecha action. OK, there’s not a lot to the show really. It’s pretty superficial. The animation is quite woeful. It's like the Japanese producers just sent out the character designs and a very brief outline of the show to some Korean animators and just overdubbed the results with whatever story they saw fit. Truly this is stunningly awful. A number of storylines are begun, but just forgotten in later episodes. Horrible, annoying, ugly off model animation, awful. I find most of Masami Obari's post early 1990’s works mediocre at best, but this is clearly the worst thing he's done. I give it 3 out of 10 only for some of the better mecha sequences.